A ‘code editor’ is exactly what its name suggests: a tool where you can write code, design, and then test your websites. There are a number of editors available on the internet which assist coders in writing great WordPress code. 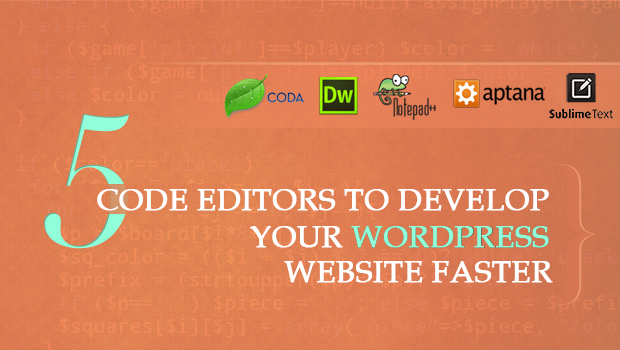 In this post, I have listed the 5 code editors which I found the best in developing a WordPress website. When it comes to WordPress, the CMS editor might not detect errors of core PHP functions and HTML. These editors, however, can help you get the best out of your code. Sublime is one of the most amazing editors that developers use for website development. What coders need is a distraction-free mode and when you are using Sublime, you get that. Some of its many great features include GoTo Anything, Multiple Selections, Command Palette, etc. It also has a very slick user interface. Besides the ones mentioned above, Sublime offers a number of other lovable features, making it one of the more popular code editors around. Many developers these days recommend Notepad++ for editing code. It is the open source replacement of the original Notepad program (which comes with Windows) and supports several languages. Even though it is built for Microsoft Windows, it can also run on Linux, UNIX, BSD, and Mac OS X (using Wine). What features distinguish Notepad++ can be easily observed after opening it against a simple Notepad file. The former offers several buttons and features which are purposeful for coders. Developers write and test static codes using Notepad++ which are then implemented on the CMS. All in all, Notepad++ is a favorite amongst much of the new generation of WordPress developers. This editor is my personal recommendation. The thing I love most about Coda is its ability to guess whether the code is HTML, CSS or PHP. The software begins suggesting the code as soon as you write your first word. Its precision in correctly guessing PHP functions and its attributes is particularly impressive. Another great feature about Coda is that it helps to indent the code automatically as you write. And that’s not all. There are many more features that differentiate it from other coding tools, such as live CSS, colorful codes, super sidebar, code focus, color making option in CSS, live preview, and much more. Aptana may not appear to be that famous, but it is still widely used by coders round the world. It ties into SASS/Compass environments and gives a command line without going into a powershell. Its built-in GIT helps making roll backs easy while its utilization of the industry’s leading web application IDE turns developing web applications into a very quick process too. Additionally, the editor harnesses the flexibility of Eclipse and focuses it into a powerful web development engine. Adobe Dreamweaver is the most common editor and a must-know for all those who are part of the web development industry. It has three code editing views, namely design, code and split. It has the ability to work with server files, and a user can build a complete website with its site tool. Dreamweaver can restore the code if your files crash due to a power blackout or some other reason. As a code editor, Dreamweaver is getting better and better in design, features and capabilities with every new version. If you know any other better editor, share it with us in the comments section.